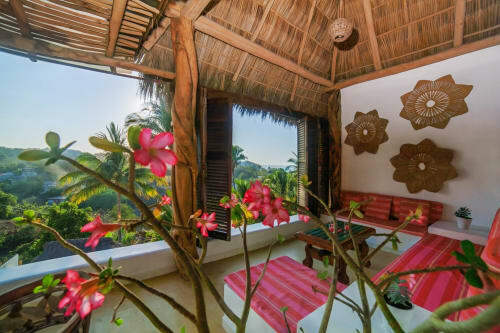 Villa Poema de Amor in Sayulita has the most outstanding views of the entire Sayulita Bay! Villa Poema de Amor in Sayulita (Villa Love Poem), is visible from anywhere on the Sayulita Bay and perfectly located with a short walk to town or the beach. Perched on the south end of the bay, Villa Poema de Amor features stunning 360-degree views of tranquil Playa de los Muertos, Sayulita, jungle, beach, and ocean as far as the eye can see. Watch the surfers ride waves from your windows and the fishermen coming ashore with their daily catch. 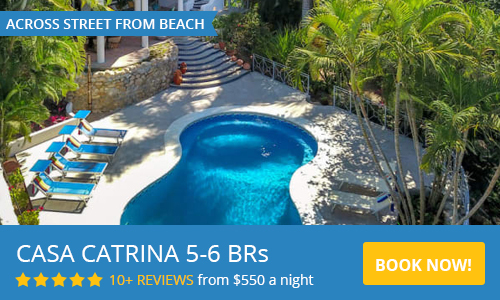 The entire Villa sleeps 10-12 people in a total of 5 bedrooms and can be rented together as one villa, or you can select from self-contained casas with separate entrances and their own cooking facilities. For 1 Bedroom casa options, including the most romantic honeymoon suite in all of Sayulita, please visit our 1 bedroom casas page. For 2 bedroom options please visit our 2 bedroom casas page. The romantic and simple lines of Villa Poema de Amor in Sayulita will delight your senses and transfer you to that place that vacationing is all about: freedom to play, dream and forget about the responsibilities of life. This is the perfect place for writers, lovers, families, newlyweds, friends, or just quiet time by the sea. Refresh, renew, relax, and be inspired by the breath-taking views. Casa Lorca is a studio style layout with King size bed with ocean view, one bath, full kitchen, living area, and indoor and outdoor dining. Fully equipped kitchen opens up to main dining and gathering area. Terrace off kitchen overlooks Los Muertos Bay and has expansive views of the ocean. The most romantic honeymoon suite on the bay! At Villa Poema de Amor, every detail is created with love and local Mexican artistry, from the hand painted sinks, to the heart-shaped rock designs in the floors, the hand carved angel mirrors, custom furniture, and intricate woodwork and ironwork. Designed by architect Miquel Valverdez and built by Arturo Fernandez, this Villa is one of the most unique in town. ***Golf carts are a great way to navigate the town and insure easy access to town and nearby beaches. We can help you with securing a rental cart for your stay through our local rental companies. Villa Poema has a cart charge outlet inside the gates. Please contact us via the form with any questions and to request a reservation. We look forward to assisting you with planning your Sayulita vacation or honeymoon! Be more honest about path to beach and road to the house. The home is exactly as it appeared in the pictures. Actually it’s even better than the pics. This was my 1st time staying in an owner direct vacation rental, so I had a lot of anxiety but once I walked into the property I was extremely happy! Our family of 12 had a blast. Hope to return again. Treat yourself to this incredible home. Best family vacation ever. Excellent home. 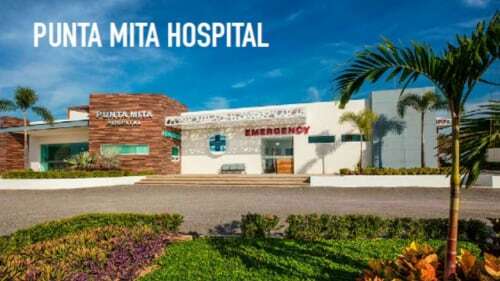 Great location next to town and restaraunts. Only a few minutes walk to the beach. Home was incredible. Clean and well furnished. We spent most of our time relaxing in the pool sipping drinks. Perfect family vacation. Great house. Beautiful and tastefully decorated. Does not feel like a rental but rather a home. And a beautiful one. The staff was very helpful checking us in and responded quickly when we had a few questions during our stay. Overall a great experience. Thank you! We stayed at this great home with our 12-month-old twin daughters, parents and friends and loved it. The pictures do not do justice to the beauty of the home. The pool was perfect for for us. We loved the location and loved just having our own private home. I took a group of women to Sayulita for a birthday celebration and we had a wonderful time. The Poema was very nice and incredible views. Getting to the beach was a challenge due to construction and poor access. We hired a personal chef and he was amazing - totally worth it. The managers of this property were very helpful and accommodating. I would highly recommend it to others. Enjoyed our stay, appreciated how the casa was stocked with everything we needed....WATER, bathroom stocked with best products + big towels + beach towels, beach chairs, kitchen met all our needs. Very clean & comfortable! Had the good fortune of staying in both Casa Hafiz and Casa Rumi for 10 days in May. The entire Villa is a marvel of artistic beauty and attention to detail. Everything works, extras like boogie board, coffee, beach umbrellas, chairs, towels provided. A very short walk to the swimming beach of Los Muertos, away from the noise of downtown yet also very accessible to the town by walking. We did not have a car. Casa Hafiz is sweet, smaller and lower than Casa Rumi but still perfect and romantic for two. Casa Rumi is amazing... sweeping views in all directions, a large bathtub with the same views and a large patio, again with endless views. Towels, bedding etc in both very plush. Oh yah, the pool, so nice to float and gaze out at, yes, the sweeping vista. My thanks to the owner and Sayulita life for making our trip so grand. If you are looking for a poetic, organic and elegant place to stay in Sayulita, look no further, just book Villa Poema de Amor for your vacation and you will have an unforgettable experience. The place is gorgeous! The architecture is designed by a poet who knows that all the world’s beauty lies in rotundities. The walls have no edges as the rooms are elliptical in shape and the stairs are spiral. This beautiful sanctuary overlooks a stunning view of the ocean, just relax in the infinity pool and enjoy the view. We were driven in luxury by friendly Fernando, the drive was worth every penny. Fernando drove us to the grocery store on our way to the villa. We received given such a warm reception by Danny who had us all settled in our place in no time. Innes, the housekeeper, was very friendly and provided world class service. The rooms are well provisioned with the cutlery and all the amenities to make you feel at home. We had a beautiful view of the ocean from our room Casa Neruda (each room is named after a mystical poet!) There is Wi-Fi and the wall sockets are good for North American electric plugs. The villa is literally 5 minutes from the beach and from town - location is perfect! We are already thinking of coming back to Sayulita with family and will definitely stay at Villa Poema de Amor again. Seasonal rates are per night and in US Dollars. Please note that $25.00 Damage waiver insurance covers up to $1500.00 worth of damage. You are personally responsible for damage incured over that amount.